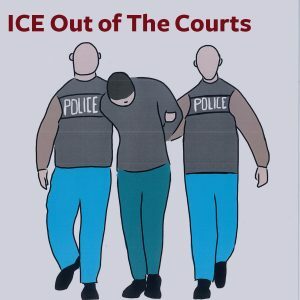 Click to view the ICE Out of the Courts Campaign! Immigrant Defense Project stands with the young people who are now at risk due to the Trump Administration’s shameful September 5, 2017 announcement that it will end the Deferred Action for Childhood Arrivals (DACA) program, and with all immigrants who face deportation. Read our joint statement with The Fortune Society here. Now, unless Congress acts quickly to pass the Dream Act, bipartisan legislation that would provide a path to legalization, by the end of this year, those young people and their families will once again have to live with the threat (and promise) of deportation overshadowing their every move. Republicans and Democrats, both long-time supporters of the Dream Act during its 17-year history, have begun negotiations on the provisions of the bill. Some of these proposed “bargains” – from increasing the volume of immigration enforcement operations and the number of immigration agents to ramping up the detention and deportation of other members of the immigrant community – are unacceptable. Across the country, we’re standing united to call for nothing less than a clean Dream Act, one that is free of any mechanisms that seek to increase deportations and that humanely leans upon our nation’s longtime commitment to inclusivity and opportunity. For Advocates and Community Members – NEW RESOURCE! FIGHTING for CLEAN DREAM: Talking Points on Criminalization, Enforcement, and Border Militarization – This resource is being disseminated by the United We Dream Network and was created by a collective of communicators at organizations who have decades of experience working to uphold the human rights of all immigrants while fighting against mass criminalization, detention, and deportation. 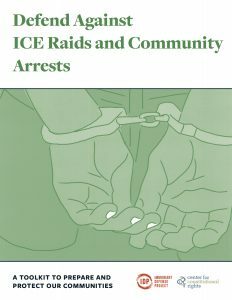 Representative organizations of this collective include: the Immigrant Defense Project, the Immigrant Legal Resource Center, the National Day Laborer Organizing Network, Enlace, Grassroots Leadership, the National Immigrant Justice Center, the National Immigration Law Center, the United We Dream Network, the Southeast Asian Resource and Action Center, and the Detention Watch Network. The Southern Border Communities Coalition provided additional support on talking points related to border militarization. DACA Renewals: Representing Clients with Contacts with the Criminal Legal System – guidance for those assisting clients who have been arrested, ticket, cited, or had another contact with the criminal legal system submitting applications to renew DACA before October 5, 2017. Practice Advisory: Advising Clients After the Announcement of the End of DACA – guidance on advising criminal defense clients in light of the September 5, 2017 announcement about the end of the Deferred Action for Childhood Arrival program.